For other uses, see Arius (disambiguation). Arius (/əˈraɪəs, ˈɛəri-/; Koinē Greek: Ἄρειος, 250 or 256–336) was a Libyan presbyter and ascetic, and priest in Baucalis in Alexandria, Egypt. His teachings about the nature of the Godhead in Christianity, which emphasized God's uniqueness and the Christ's subordination under the Father, and his opposition to what would become the dominant Christology, Homoousian Christology, made him a primary topic of the First Council of Nicaea, which was convened by Emperor Constantine the Great in 325. After Emperors Licinius and Constantine legalized and formalized the Christianity of the time in the Roman Empire, Constantine sought to unify the newly recognized Church and remove theological divisions. The Christian Church was divided over disagreements on Christology, or, the nature of the relationship between Jesus and God. Homoousian Christians, including Athanasius of Alexandria, used Arius and Arianism as epithets to describe those who disagreed with their doctrine of coequal Trinitarianism, a Homoousian Christology representing God the Father and Jesus Christ the Son as "of one essence" ("consubstantial") and coeternal. Negative writings describe Arius's theology as one in which there was a time before the Son of God, when only God the Father existed. Despite concerted opposition, Arian Christian churches persisted throughout Europe, the Middle East, and North Africa, especially in various Germanic kingdoms, until suppressed by military conquest or voluntary royal conversion between the fifth and seventh centuries. The Son's precise relationship with the Father had been discussed for decades before Arius's advent; Arius intensified the controversy and carried it to a Church-wide audience, where others like Eusebius of Nicomedia proved much more influential in the long run. In fact, some later Arians disavowed the name, claiming not to have been familiar with the man or his specific teachings. However, because the conflict between Arius and his foes brought the issue to the theological forefront, the doctrine he proclaimed—though not originated—is generally labeled as "his". Reconstructing the life and doctrine of Arius has proven to be a difficult task, as none of his original writings survive. Emperor Constantine ordered their burning while Arius was still living, and any that survived this purge were later destroyed by his Orthodox opponents. Those works which have survived are quoted in the works of churchmen who denounced him as a heretic. This leads some — but not all — scholars to question their reliability. Arius was of Berber descent. His father's name is given as Ammonius. Arius is believed to have been a student at the exegetical school in Antioch, where he studied under Saint Lucian. Having returned to Alexandria, Arius, according to a single source, sided with Meletius of Lycopolis in his dispute over the re-admission of those who had denied Christianity under fear of Roman torture, and was ordained a deacon under the latter's auspices. He was excommunicated by Bishop Peter of Alexandria in 311 for supporting Meletius, but under Peter's successor Achillas, Arius was re-admitted to Christian communion and in 313 made presbyter of the Baucalis district in Alexandria. Although his character has been severely assailed by his opponents, Arius appears to have been a man of personal ascetic achievement, pure morals, and decided convictions. Paraphrasing Epiphanius of Salamis, an opponent of Arius, Catholic historian Warren H. Carroll describes him as "tall and lean, of distinguished appearance and polished address. Women doted on him, charmed by his beautiful manners, touched by his appearance of asceticism. Men were impressed by his aura of intellectual superiority." 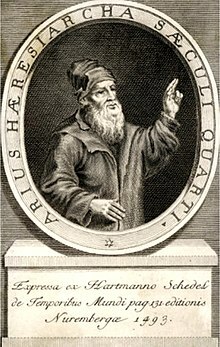 Though Arius was also accused by his opponents of being too liberal, and too loose in his theology, engaging in heresy (as defined by his opponents), some historians argue that Arius was actually quite conservative, and that he deplored how, in his view, Christian theology was being too freely mixed with Greek paganism. Arius is notable primarily because of his role in the Arian controversy, a great fourth-century theological conflict that led to the calling of the first ecumenical council of the Church. This controversy centered upon the nature of the Son of God, and his precise relationship to God the Father. 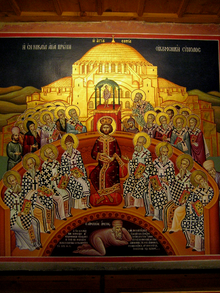 Before the council of Nicaea, the Christian world knew several competing Christological ideas. Church authorities condemned some of these ideas but did not put forth a uniform formula. The Nicaean formula was a rapidly concluded solution to the general Christological debate. The Trinitarian historian Socrates of Constantinople reports that Arius sparked the controversy that bears his name when Alexander of Alexandria, who had succeeded Achillas as the Bishop of Alexandria, gave a sermon stating the similarity of the Son to the Father. Arius interpreted Alexander's speech as being a revival of Sabellianism, condemned it, and then argued that "if the Father begat the Son, he that was begotten had a beginning of existence: and from this it is evident, that there was a time when the Son was not. It therefore necessarily follows, that he [the Son] had his substance from nothing." This quote describes the essence of Arius's doctrine. Socrates of Constantinople believed that Arius was influenced in his thinking by the teachings of Lucian of Antioch, a celebrated Christian teacher and martyr. In a letter to Patriarch Alexander of Constantinople Arius' bishop, Alexander of Alexandria, wrote that Arius derived his theology from Lucian. The express purpose of Alexander's letter was to complain of the doctrines that Arius was spreading, but his charge of heresy against Arius is vague and unsupported by other authorities. Furthermore, Alexander's language, like that of most controversialists in those days, is quite bitter and abusive. Moreover, even Alexander never accused Lucian of having taught Arianism; rather, he accused Lucian ad invidiam of heretical tendencies—which apparently, according to him, were transferred to his pupil, Arius. The noted Russian historian Alexander Vasiliev refers to Lucian as "the Arius before Arius". Like many third-century Christian scholars, Arius was influenced by the writings of Origen, widely regarded as the first great theologian of Christianity. However, while he drew support from Origen's theories on the Logos, the two did not agree on everything. Arius clearly argued that the Logos had a beginning and that the Son, therefore, was not eternal, and that the Son is clearly subordinate to the Father, the Logos being the highest of the Created Order. This idea is summarized in the statement "there was a time when the Son was not." By way of contrast, Origen taught that the Son was subject to the Father, and some of Origen's writings seem to imply that the Son is subordinate and less than the Father in some ways. However, Origen believed the relation of the Son to the Father had no beginning, and that the Son was "eternally generated". Arius objected to Origen's doctrine, complaining about it in his letter to the Nicomedian Eusebius, who had also studied under Lucian. Nevertheless, despite disagreeing with Origen on this point, Arius found solace in his writings, which used expressions that favored Arius's contention that the Logos was of a different substance than the Father, and owed his existence to his Father's will. However, because Origen's theological speculations were often proffered to stimulate further inquiry rather than to put an end to any given dispute, both Arius and his opponents were able to invoke the authority of this revered (at the time) theologian during their debate. Arius emphasized the supremacy and uniqueness of God the Father, meaning that the Father alone is infinite and eternal and almighty, and that therefore the Father's divinity must be greater than the Son's. Arius taught that the Son had a beginning, contrary to Origen, who taught that the Son was less than the Father only in power, but not in time. Arius maintained that the Son possessed neither the eternity nor the true divinity of the Father, but was rather made "God" only by the Father's permission and power, and that the Logos was rather the very first and the most perfect of God's productions, before ages. The Bishop of Alexandria exiled the presbyter following a council of local priests. Arius's supporters vehemently protested. Numerous bishops and Christian leaders of the era supported his cause, among them Eusebius of Nicomedia. The Christological debate could no longer be contained within the Alexandrian diocese. By the time Bishop Alexander finally acted against Arius, Arius's doctrine had spread far beyond his own see; it had become a topic of discussion—and disturbance—for the entire Church. 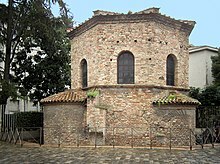 The Church was now a powerful force in the Roman world, with Emperors Licinius and Constantine I having legalized it in 313 through the Edict of Milan. Emperor Constantine had taken a personal interest in several ecumenical issues, including the Donatist controversy in 316, and he wanted to bring an end to the Christological dispute. To this end, the emperor sent Hosius, bishop of Córdoba to investigate and, if possible, resolve the controversy. Hosius was armed with an open letter from the Emperor: "Wherefore let each one of you, showing consideration for the other, listen to the impartial exhortation of your fellow-servant." But as the debate continued to rage despite Hosius' efforts, Constantine in AD 325 took an unprecedented step: he called a council to be composed of church prelates from all parts of the empire to resolve this issue, possibly at Hosius' recommendation. All secular dioceses of the empire sent one or more representatives to the council, save for Roman Britain; the majority of the bishops came from the East. Pope Sylvester I, himself too aged to attend, sent two priests as his delegates. Arius himself attended the council, as did his bishop, Alexander. Also there were Eusebius of Caesarea, Eusebius of Nicomedia and the young deacon Athanasius, who would become the champion of the Trinitarian view ultimately adopted by the council and spend most of his life battling Arianism. Before the main conclave convened, Hosius initially met with Alexander and his supporters at Nicomedia. The council would be presided over by the emperor himself, who participated in and even led some of its discussions. At this First Council of Nicaea twenty-two bishops, led by Eusebius of Nicomedia, came as supporters of Arius. But when some of Arius's writings were read aloud, they are reported to have been denounced as blasphemous by most participants. Those who upheld the notion that Christ was co-eternal and con-substantial with the Father were led by the bishop Alexander. Athanasius was not allowed to sit in on the Council since he was only an arch-deacon. But Athanasius is seen as doing the legwork and concluded (as Bishop Alexander conveyed in the Athanasian Trinitarian defense and also according to the Nicene Creed adopted at this Council and,) that the Son was of the same essence (homoousios) with the Father (or one in essence with the Father), and was eternally generated from that essence of the Father. Those who instead insisted that the Son of God came after God the Father in time and substance, were led by Arius the presbyter. For about two months, the two sides argued and debated, with each appealing to Scripture to justify their respective positions. Arius argued for the supremacy of God the Father, and maintained that the Son of God was simply the oldest and most beloved Creature of God, made from nothing, because of being the direct offspring. Arius taught that the pre-existent Son was God's First Production (the very first thing that God actually ever did in His entire eternal existence up to that point), before all ages. Thus he insisted that only God the Father had no beginning, and that the Father alone was infinite and eternal. Arius maintained that the Son had a beginning. Thus, said Arius, only the Son was directly created and begotten of God; furthermore, there was a time that He had no existence. He was capable of His own free will, said Arius, and thus "were He in the truest sense a son, He must have come after the Father, therefore the time obviously was when He was not, and hence He was a finite being." Arius appealed to Scripture, quoting verses such as John 14:28: "the Father is greater than I". And also Colossians 1:15: "the firstborn of all creation." Thus, Arius insisted that the Father's Divinity was greater than the Son's, and that the Son was under God the Father, and not co-equal or co-eternal with Him. According to some accounts in the hagiography of Nicholas of Myra, debate at the council became so heated that at one point, Nicholas struck Arius across the face. The majority of the bishops ultimately agreed upon a creed, known thereafter as the Nicene creed. It included the word homoousios, meaning "consubstantial", or "one in essence", which was incompatible with Arius' beliefs. On June 19, 325, council and emperor issued a circular to the churches in and around Alexandria: Arius and two of his unyielding partisans (Theonas and Secundus) were deposed and exiled to Illyricum, while three other supporters—Theognis of Nicaea, Eusebius of Nicomedia and Maris of Chalcedon—affixed their signatures solely out of deference to the emperor. The following is part of the ruling made by the emperor denouncing Arius's teachings with fervor. In addition, if any writing composed by Arius should be found, it should be handed over to the flames, so that not only will the wickedness of his teaching be obliterated, but nothing will be left even to remind anyone of him. And I hereby make a public order, that if someone should be discovered to have hidden a writing composed by Arius, and not to have immediately brought it forward and destroyed it by fire, his penalty shall be death. As soon as he is discovered in this offense, he shall be submitted for capital punishment....."
The Homoousian party's victory at Nicaea was short-lived, however. Despite Arius's exile and the alleged finality of the Council's decrees, the Arian controversy recommenced at once. When Bishop Alexander died in 327, Athanasius succeeded him, despite not meeting the age requirements for a hierarch. Still committed to pacifying the conflict between Arians and Trinitarians, Constantine gradually became more lenient toward those whom the Council of Nicaea had exiled. Though he never repudiated the council or its decrees, the emperor ultimately permitted Arius (who had taken refuge in Palestine) and many of his adherents to return to their homes, once Arius had reformulated his Christology to mute the ideas found most objectionable by his critics. Athanasius was exiled following his condemnation by the First Synod of Tyre in 335 (though he was later recalled), and the Synod of Jerusalem the following year restored Arius to communion. The emperor directed Alexander of Constantinople to receive Arius, despite the bishop's objections; Bishop Alexander responded by earnestly praying that Arius might perish before this could happen. It was then Saturday, and Arius was expecting to assemble with the church on the day following: but divine retribution overtook his daring criminalities. For going out of the imperial palace, attended by a crowd of Eusebian partisans like guards, he paraded proudly through the midst of the city, attracting the notice of all the people. As he approached the place called Constantine's Forum, where the column of porphyry is erected, a terror arising from the remorse of conscience seized Arius, and with the terror a violent relaxation of the bowels: he therefore enquired whether there was a convenient place near, and being directed to the back of Constantine's Forum, he hastened thither. Soon after a faintness came over him, and together with the evacuations his bowels protruded, followed by a copious hemorrhage, and the descent of the smaller intestines: moreover portions of his spleen and liver were brought off in the effusion of blood, so that he almost immediately died. The scene of this catastrophe still is shown at Constantinople, as I have said, behind the shambles in the colonnade: and by persons going by pointing the finger at the place, there is a perpetual remembrance preserved of this extraordinary kind of death. While many post-Nicene Christians asserted Arius's death as miraculous—a consequence of his heretical views—several recent writers mention that Arius may have simply been poisoned by his opponents. Even with its namesake's demise, the Arian controversy was far from over, and would not be settled for decades—or centuries, in parts of the West. Historians report that Constantine, who had not been baptized for most of his lifetime, was baptized on his deathbed by the Arian bishop, Eusebius of Nicomedia. But since many persons are disturbed by questions concerning what is called in Latin substantia, but in Greek ousia, that is, to make it understood more exactly, as to 'coessential', or what is called, 'like-in-essence', there ought to be no mention of any of these at all, nor exposition of them in the Church, for this reason and for this consideration, that in divine Scripture nothing is written about them, and that they are above men's knowledge and above men's understanding. Following the abortive effort by Julian the Apostate to restore paganism in the empire, the emperor Valens — himself an Arian — renewed the persecution of Nicene bishops. However, Valens's successor Theodosius I ended Arianism once and for all among the elites of the Eastern Empire through a combination of imperial decree, persecution, and the calling of the Second Ecumenical Council in 381, which condemned Arius anew while reaffirming and expanding the Nicene Creed. This generally ended the influence of Arianism among the non-Germanic peoples of the Roman Empire. Things went differently in the Western Empire. During the reign of Constantius II, the Arian Gothic convert Ulfilas was consecrated a bishop by Eusebius of Nicomedia and sent to missionize his people. His success ensured the survival of Arianism among the Goths and Vandals until the beginning of the eighth century, when these kingdoms succumbed to their Nicean neighbors or accepted Nicean Christianity. Arians also continued to exist in North Africa, Spain and portions of Italy, until finally suppressed during the sixth and seventh centuries. In the 12th century, Peter the Venerable saw the Prophet Muhammad as "the successor of Arius and the precursor to the Anti-Christ". During the Protestant Reformation, a Polish sect known as the Polish Brethren were often referred to as Arians, due to their rejection of the Trinity. There are several contemporary Christian and Post-Christian denominations today that echo Arian thinking. Jehovah's Witnesses are often referred to as "modern-day Arians" or sometimes "Semi-Arians", usually by their opponents. While there are some significant similarities in theology and doctrine, the Witnesses differ from Arians by saying that the Son can fully know the Father (something Arius himself denied), and by their denial of literal personality to the Holy Spirit. Arius considered the Holy Spirit to be a person or a high-ranking angel, which had a beginning as a creature, whereas the Witnesses consider the Holy Spirit to be God's "active force" or divine "energy", which had no beginning, and is not an actual person. The original Arians also generally prayed directly to Jesus, whereas the Witnesses pray to God, through Jesus as a mediator. Members of The Church of Jesus Christ of Latter-day Saints (LDS Church) are sometimes accused of being Arians by their detractors. However, the Christology of the LDS religion differs in several significant aspects from Arian theology. Some Christians in the Unitarian Universalist movement are influenced by Arian ideas. Contemporary Unitarian Universalist Christians often are either Arian or Socian in their Christology, seeing Jesus as a distinctive moral figure, but not God the Father, or follow Origen's logic of Universal Salvation, and thus potentially affirm the Trinity, but assert that all are already saved. That God was not always the Father, but that there was a period when he was not the Father; that the Word of God was not from eternity, but was made out of nothing; for that the ever-existing God ('the I AM'—the eternal One) made him who did not previously exist, out of nothing; wherefore there was a time when he did not exist, inasmuch as the Son is a creature and a work. That he is neither like the Father as it regards his essence, nor is by nature either the Father's true Word, or true Wisdom, but indeed one of his works and creatures, being erroneously called Word and Wisdom, since he was himself made of God's own Word and the Wisdom which is in God, whereby God both made all things and him also. Wherefore he is as to his nature mutable and susceptible of change, as all other rational creatures are: hence the Word is alien to and other than the essence of God; and the Father is inexplicable by the Son, and invisible to him, for neither does the Word perfectly and accurately know the Father, neither can he distinctly see him. The Son knows not the nature of his own essence: for he was made on our account, in order that God might create us by him, as by an instrument; nor would he ever have existed, unless God had wished to create us. God has not always been Father; there was a moment when he was alone, and was not yet Father: later he became so. The Son is not from eternity; he came from nothing. This question of the exact relationship between the Father and the Son (a part of the theological science of Christology) had been raised some fifty years before Arius, when Paul of Samosata was deposed in 269 for agreeing with those who used the word homoousios (Greek for same substance) to express the relation between the Father and the Son. This term was thought at that time to have a Sabellian tendency, though—as events showed—this was on account of its scope not having been satisfactorily defined. In the discussion which followed Paul's deposition, Dionysius, the Bishop of Alexandria, used much the same language as Arius did later, and correspondence survives in which Pope Dionysius blames him for using such terminology. Dionysius responded with an explanation widely interpreted as vacillating. The Synod of Antioch, which condemned Paul of Samosata, had expressed its disapproval of the word homoousios in one sense, while Bishop Alexander undertook its defense in another. Although the controversy seemed to be leaning toward the opinions later championed by Arius, no firm decision had been made on the subject; in an atmosphere so intellectual as that of Alexandria, the debate seemed bound to resurface—and even intensify—at some point in the future. that the worlds were created through him, so he must have existed before them and before all time. However, there was a "once" [Arius did not use words meaning "time", such as chronos or aion] when He did not exist, before he was begotten of the Father. 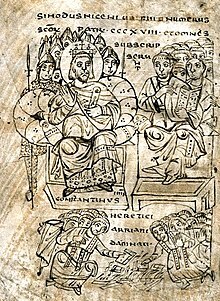 Three surviving letters attributed to Arius are his letter to Alexander of Alexandria, his letter to Eusebius of Nicomedia, and his confession to Constantine. In addition, several letters addressed by others to Arius survive, together with brief quotations contained within the polemical works of his opponents. These quotations are often short and taken out of context, and it is difficult to tell how accurately they quote him or represent his true thinking. Arius' Thalia (literally, "Festivity", "banquet"), a popularized work combining prose and verse and summarizing his views on the Logos, survives in quoted fragmentary form. In the Thalia, Arius says that God's first thought was the creation of the Son, before all ages, therefore time started with the creation of the Logos or Word in Heaven (lines 1-9, 30-32); explains how the Son could still be God, even if he did not exist eternally (lines 20-23); and endeavors to explain the ultimate incomprehensibility of the Father to the Son (lines 33-39). The two available references from this work are recorded by his opponent Athanasius: the first is a report of Arius's teaching in Orations Against the Arians, 1:5-6. This paraphrase has negative comments interspersed throughout, so it is difficult to consider it as being completely reliable. The second quotation is found in the document On the Councils of Arminum and Seleucia, also known as De Synodis, pg. 15. This second passage is entirely in irregular verse, and seems to be a direct quotation or a compilation of quotations; it may have been written by someone other than Athanasius, perhaps even a person sympathetic to Arius. This second quotation does not contain several statements usually attributed to Arius by his opponents, is in metrical form, and resembles other passages that have been attributed to Arius. It also contains some positive statements about the Son. But although these quotations seem reasonably accurate, their proper context is lost, thus their place in Arius' larger system of thought is impossible to reconstruct. Αὐτὸς γοῦν ὁ θεὸς καθό ἐστιν ἄρρητος ἅπασιν ὑπάρχει. ... And so God Himself, as he really is, is inexpressible to all. ἴσον οὐδὲ ὅμοιον, οὐχ ὁμόδοξον ἔχει μόνος οὗτος. ἀίδιον δὲ αὐτὸν σέβομεν διὰ τὸν ἐν χρόνοις γεγαότα. οὐδὲ γάρ ἐστιν ἴσος, ἀλλ' οὐδὲ ὁμοούσιος αὐτῷ. σοφὸς δέ ἐστιν ὁ θεός, ὅτι τῆς σοφίας διδάσκαλος αύτός. τοῖς τε διὰ υἱοῦ καὶ αὐτῷ τῷ υἱῷ ἀόρατος ὁ αὐτός. He is invisible both to things which were made through the Son, and also to the Son himself. ὑπομένει ὁ υἱὸς ἰδεῖν τὸν πατέρα, ὡς θέμις ἐστίν. So there is a Triad, not in equal glories. Their beings (hypostaseis) are not mixed together among themselves. μία τῆς μιᾶς ἐνδοξοτέρα δόξαις ἐπ' ἄπειρον. ξένος τοῦ υἱοῦ κατ' οὐσίαν ὁ πατήρ, ὅτι ἄναρχος ὐπάρχει. The Father in his essence (ousia) is a foreigner to the Son, because he exists without beginning. σύνες ὅτι ἡ μονὰς ἦν, ἡ δυὰς δὲ οὐκ ἦν, πρὶν ὑπάρξῃ. Understand that the Monad [eternally] was; but the Dyad was not before it came into existence. αὐτίκα γοῦν υἱοῦ μὴ ὄντος ὁ πατὴρ θεός ἐστι. It immediately follows that, although the Son did not exist, the Father was still God. μονογενὴς θεός ἐστι καὶ ἑκατέρων ἀλλότριος οὗτος. ἡ σοφία σοφία ὑπῆρξε σοφοῦ θεοῦ θελήσει. δόξα θεοῦ, ἀλήθειά τε καὶ εἰκὼν καὶ λόγος οὗτος. God's glory, Truth, Image, and Word. σύνες ὅτι καὶ ἀπαύγασμα καὶ φῶς ἐπινοεῖται. διαφορώτερον δὲ ἢ κρείττονα ἢ μείζονα οὐχί. ἰσχυρὸς θεὸς ὢν τὸν κρείττονα ἐκ μέρους ὑμνεῖ. He, though strong God, praises in part (ek merous) his superior. ὥστε οὐδὲν τῶν λεγομένων κατά τε κατάληψιν συνίει ἐξειπεῖν ὁ υἱός. So that the son does not comprehend any of these things or have the understanding to explain them. ἀδύνατα γὰρ αὐτῷ τὸν πατέρα τε ἐξιχνιάσει, ὅς ἐστιν ἐφ' ἑαυτοῦ. υἱὸς γὰρ ὢν θελήσει πατρὸς ὑπῆρξεν ἀληθῶς. ἐμπερινοῆσαι ἢ ἐμπεριδράξασθαι οὐχ οἷόν τέ ἐστιν. is not able to conceive of or grasp the existence of that which has no beginning. A slightly different edition of the fragment of the Thalia from De Synodis is given by G.C. Stead, and served as the basis for a translation by R.P.C. Hanson. Stead argued that the Thalia was written in anapestic meter, and edited the fragment to show what it would look like in anapests with different line breaks. Hanson based his translation of this fragment directly on Stead's text. Here is Stead's edition with Hanson's translation. God himself, therefore, in himself remains mysterious (ἄρρετος). He alone has no equal, none like him, none of equal glory. ἀΐδιον δ'αὐτὸν σέβομεν διὰ τὸν ἐν χρόνοις γεγαότα. we worship him as eternal in contrast to him who came into existence in times (χρόνοις). καὶ ἤνεγκεν εἰς υἱον ἑαυτῷ τόνδε τεκνοποιήσας. and he made him into a Son for himself; begetting (τεκνοποιήσας) him. οὐδὲ γάρ ἐστιν ἴσος ... ἀλλ' οὐδ' ὁμοούσιος αὐτῷ. and he is not equal ... far less is he consubstantial (ὁμοούσιος) to him (God). σοφὸς [δ'] ἐστιν ὁ θεὸς, ὅτι τῆς σοφίας διδάσκαλος αύτός. And God is wise because he is the Teacher of Wisdom. ὑπομένει ὁ υἱὸς ἰδεῖν ... τὸν πατέρ' ὡς θέμις ἐστιν. the Son is able to see... the Father as is determined (θέμις). μία τῆς μιᾶς ἐνδοξοτέρα δοξαῖς ἐπ' ἄπειρον. The sole glory is of the Sole (μία τῆς μιᾶς), infinitely more splendid in his glories. ξένος τοῦ υἱοῦ κατ' οὐσίαν ὁ πατήρ ὅτι ἄναρχος ὐπάρχει. The father is in his substance (οὐσίαν) alien (ξένος) from the Son because he remains without beginning. σύνες <οὖν> ὅτι ἡ μονὰς ἦν, ἡ δυὰς δ' οὐκ ἦν πρὶν ὑπάρξῃ. Understand therefore that the Mondad (μονὰς) existed, but the Dyad (δυὰς) did not exist before it attained existence. So the Son having not existed attained existence by the Father's will. μονογενὴς θεός ἐστι<ν> κἀ κατέρων ἀλλότριος οὗτος. He is only-begotten God and he is different from any others. and so he is apprehended in an uncountable number of aspects (ἐπινοίαις). He is God's Glory and Truth, and Image and Word. σύνες ὅτι καὶ ἀπαύγασμά <τε> καὶ φῶς ἐπινοεῖται. Understand too that he is apprehended as Reflection (ἀπαύγασμα) also and Light. διαφορώτερον δ' ἢ κρείττονα ἢ μείζονα, οὐχί. but not someone more important or more powerful or greater. ἐξ ὅτε κἀφ' οὖ κἀπὸ τότ' ἐκ τοῦ θεοῦ ὑπέστη. when and whence and from what time he is from God. ἰσχυρὸς <γὰρ> θεὸς ὢν τὸν κρείττονα ἐκ μέρους ὑμνεῖ. For he is the Mighty God [i.e., the Son, Isa 9:15] and in some degree (ἐκ μέρους) worships the Greater. to trace out in the case of the Father what he is in himself. for though he is the Son he is really so by the will of the Father. should [text corrupt] in comprehending his own begetter? ἐμπερινοῆσ' ἢ ἐμπεριδράξασθ' οὐχ οἷόν τέ ἐστιν. could not possibly comprehend or grasp. ^ a b Torkington, David (2011-02-03). Wisdom from Franciscan Italy: The Primacy of Love. John Hunt Publishing. p. 113. ISBN 9781846944420. ^ Anatolios, Khaled (2011). "2. Development of Trinitarian Doctrine: A Model and Its Application". Retrieving Nicaea. Grand Rapids: BakerAcademic. p. 44. ISBN 080103132X. Arius, who was born in Libya, was a respected ascetic and presbyter at the church of the Baucalis in Alexandria. ^ Williams, Rowan (2002) . Arius (Revised ed.). Grand Rapids, Michigan: W.B. Eerdmans. p. 98. ISBN 0-8028-4969-5. ^ Constantine the Great Rules - National Geographic - Retrieved 23 September 2014. ^ a b Hanson, R P C (2007). The Search for the Christian Doctrine of God. Grand Rapids: Baker Academic. pp. 127–128. ISBN 0-8010-3146-X. ^ Kopeck, M R (1985). "Neo Arian Religion: Evidence of the Apostolic Constitutions". Arianism: Historical and Theological Reassessments: 160–162. ^ Dennison, James T Jr. "Arius "Orthodoxos"; Athanasius "Politicus": The Rehabilitation of Arius and the Denigration of Athanasius". Lynnwood: Northwest Theological Seminary. Retrieved 2 May 2012. ^ O'Carroll, Michael (1987). Trinitas. Collegeville: Liturgical Press. p. 23. ISBN 0-8146-5595-5. ^ a b Carroll, A. History of Christendom, Volume II. p. 10. ^ Williams, Rowan (2002) . Arius (Revised ed.). Grand Rapids, Michigan: W.B. Eerdmans. ISBN 0-8028-4969-5. ^ Williams, Rowan (2002) . Arius (Revised ed.). Grand Rapids, Michigan: W.B. Eerdmans. p. 235. ISBN 0-8028-4969-5. ^ Hanson, R P C (2007). The Search for the Christian Doctrine of God. Grand Rapids: Baker Academic. pp. 60–72. ISBN 0-8010-3146-X. ^ Socrates. "The Dispute of Arius with Alexander, his Bishop.". The Ecclesiastical Histories of Socrates Scholasticus. Retrieved 2 May 2012. ^ a b c d e f Vasiliev, Al (1928). "The empire from Constantine the Great to Justinian". History of the Byzantine Empire. Retrieved 2 May 2012. ^ Moore, Edward (2 May 2005). "Origen of Alexandria". Internet Encyclopedia of Philosophy. The University of Tennessee at Martin. Retrieved 2 May 2012. ^ "Arius of Alexandria, Priest and Martyr". Holy Catholic and Apostolic Church (Arian Catholic). Retrieved 2 May 2012. ^ Rubinstein, Richard. When Jesus Became God, The Struggle to Define Christianity during the Last Days of Rome. p. 57. ^ Matt Perry - Athanasius and his Influence at the Council of Nicaea - QUODLIBET JOURNAL - Retrieved 29 May 2014. ^ "Babylon The Great Has Fallen!" - God's Kingdom Rules! Watchtower Bible and Tract Society of New York, Inc. - page 477. ^ Bishop Nicholas Loses His Cool at the Council of Nicaea. From the St. Nicholas center. See also St. Nicholas the Wonderworker, from the website of the Orthodox Church in America. Retrieved on 2010-02-02. ^ In this corner, St. Nicholas!. Catholic Exchange. Published: 5 December 2012. ^ Athanasius (23 January 2010). "Edict by Emperor Constantine against the Arians". Fourth Century Christianity. Wisconsin Lutheran College. Archived from the original on 19 August 2011. Retrieved 2 May 2012. ^ Draper, John William (1875). The History of the Intellectual Development of Europe. pp. 358–359. , quoted in "The events following the Council of Nicaea". The Formulation of the Trinity. Retrieved 2 May 2012. ^ Socrates. "The Death of Arius". The Ecclesiastical Histories of Socrates Scholasticus. Retrieved 2 May 2012. ^ Gibbon, Edward (2012). The History of the Decline and Fall of the Roman Empire. CreateSpace. ISBN 1-4700-6709-9. ^ Kirsch, Jonathan (2005). God Against the Gods. New York: Penguin Compass. ISBN 0-14-219633-9. ^ Freeman, Charles (2005). The Closing of the Western Mind (1st Vintage Books ed.). New York: Vintage Books. ISBN 1-4000-3380-2. ^ Scrum, D S. "Arian Reaction - Athanasius". Biography of Arius. Retrieved 2 May 2012. ^ a b Jones, A H M (1990). The Later Roman Empire, 284-602: A Social, Economic, and Administrative Survey. Baltimore: Johns Hopkins University Press. p. 118. ISBN 0-8018-3353-1. ^ "Second Creed of Sirmium or "The Blasphemy of Sirmium"". www.fourthcentury.com. Retrieved 2017-03-09. ^ Freeman, Charles. A.D. 381, Heretics, Pagans and the Dawn of the Monotheistic State. Overlook Press. ^ "Arianism". The Columbia Encyclopedia. Retrieved 2 May 2012. ^ Wilbur, Earl Morse (1977). "The Socinian Exiles in East Prussia". A History of Unitarianism in Transylvania, England, and America. Boston: Beacon Press. ^ Institute for Metaphysical Studies—The Arian Christian Bible - Metaphysical Institute, 2010. Page 209. Retrieved 10 June 2014. ^ Adam Bourque - Ten Things You Didn’t Know about Jehovah’s Witnesses.—Michigan Skeptics Association. Retrieved 10 June 2014. ^ Tuttle, Dainel S (1981). "Mormons". A Religious Encyclopedia: 1578. ^ "Are Mormons Arians?". Mormon Metaphics. 19 January 2006. Archived from the original on 1 March 2012. Retrieved 2 May 2012. ^ Socrates. "Division begins in the Church from this Controversy; and Alexander Bishop of Alexandria excommunicates Arius and his Adherents.". The Ecclesiastical Histories of Socrates Scholasticus. Retrieved 2 May 2012. ^ Arius. "Thalia". Fourth Century Christianity. Wisconsin Lutheran College. Archived from the original on 28 April 2012. Retrieved 2 May 2012. ^ Williams, Rowan (2002) . Arius (Revised ed.). Grand Rapids: W.B. Eerdmans. p. 99. ISBN 0-8028-4969-5. ^ a b Williams, Rowan (2002) . Arius (Revised ed.). Grand Rapids: W.B. Eerdmans. pp. 98–99. ISBN 0-8028-4969-5. ^ Stevenson, J (1987). A New Eusebius. London: SPCK. pp. 330–332. ISBN 0-281-04268-3. ^ Opitz, Hans-Georg (1935). Athanasius Werke. pp. 242–243. Retrieved 16 August 2016. ^ West, Aaron J. "Arius - Thalia". Fourth Century Christianity. Wisconsin Lutheran College. Archived from the original on 2012-04-28. ^ West, Aaron J. "Arius - Thalia in Greek and English". Fourth Century Christianity. Wisconsin Lutheran College. Retrieved 16 August 2016. ^ Stead, G.C. (April 1978). "The Thalia of Arius and the Testimony of Athanasius". Journal of Theological Studies. 39 (1): 48–50. ^ Hanson, R.P.C. (1988). The Search for the Christian Doctrine of God. Edinburgh: T&T Clark. pp. 14–15. Athanasius of Alexandria. History of the Arians. Online at CCEL. Part I Part II Part III Part IV Part V Part VI Part VII Part VIII. Accessed 13 December 2009. Socrates Scholasticus. A.C. Zenos, Translator. Nicene and Post-Nicene Fathers, Second Series, Vol. 2 - Socrates: Church History from A.D. 305-438. Online at newadvent.org. Latinovic, Vladimir. Arius Conservativus? The Question of Arius' Theological Belonging in: Studia Patristica, XCV, p. 27-42. Peeters, 2017. Schaff, Philip. "Theological Controversies and the Development of Orthodoxy". In History of the Christian Church, Vol III, Ch. IX. Online at CCEL. Accessed 13 December 2009. Wace, Henry. A Dictionary of Christian Biography and Literature to the End of the Sixth Century A.D., with an Account of the Principal Sects a.d Heresies. Online at CCEL. Accessed 13 December 2009. "Arius" . The American Cyclopædia. 1879.